Hidden Power is one of the missions of the Troy mission set. This mission is quite possible to solo after you have passed the level 120 upgrade quest. There is a really fantastic video on youtube with a spoken commentary by angster40 which should be easy to find. It tells you all about positioning, traps and such. But ignore the comments about the mission being hard, because due to several updates they have watered down the mission greatly. There are nasty groups of mobs waiting for you. It is most important in this mission not to rush forward but be as careful as possible. Better remain just out of aggro range, heal up, seth up, and then do a full onslaught on your next turn than to risk a hoard attack on you. The plateau you enter after climbing up the ramp contains 6 venom commanders and lots of other nasty mobs, not to speak of the mobs coming from the summon portal west of Dark Alexandra. So be extra careful there. After Alexandra the rest is easy. Before the gate after which you find the final boss, in H13/H14 I lay 2 net traps after clearing away the hostile ones (which you can do with only 1 scroll if you stand right between them). Then take the gate down, lure the enemy out (bomb the mobs just before the boss) and debuff and snipe the boss. I have updated the map (see comments). And there may be traps inside the boss chamber itself but you should never ever be forced to enter it. Here is a video of a run with Fritz, my musician main alt, then level 123. I did not use a blessing potion/license to compensate for my good (but not uber, no +10 weapon or such) gear. 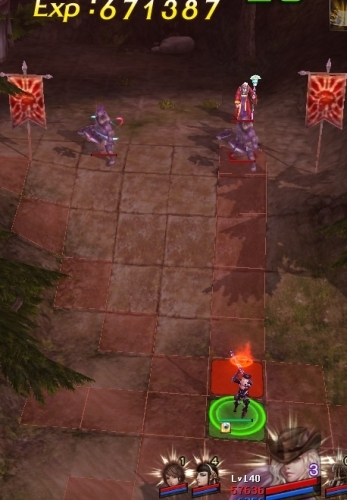 T3 – there are 2 traps, flame trap right here and net trap a little closer to 1st boss. Scrolling off at one box before the trigger area for cutscene will dispel both. and I believe there are 2 flame traps instead of net traps in front of the gate. Could be more traps in final boss area but since I used scroll in front of gate, it dispels all the last traps. Updated traps, thanks for the hints. I vaguely remember the last traps before the gate being net traps and I let it stand by that for now because I prefer to err on the cautious side… When I feel brave enough I will test it out though. Is it (still) possible, to destroy the mystic stone in D9 from E8. I saw it in the video of MrAtupal, but angster40 didn’t. I couldn’t do it as well, even with max ranged catapult. So I’m asking. PhoenixCalgary was able to help on db-atlantica. It’s not possible anymore. Still possible, though, not so much with catapult without taking a hit. Can with cannon main, however. The three traps in the last MS room (F13, G13, G14) seem to be gone now. I don’t think so. At least when I ran it last time (after Spelltower patch) I got the message “…disarmed a trap” when I scrolled at the appropriate places. G13 and 14 are now flame traps, you don’t have to worry about them as long as you stay between the 2 rows of pillars. Yes, verified it and changed the trap map accordingly. And you can take out the first mystic stone (the one on the plateau with the horde of venom commanders) already from H7 with your cannon main (or catapult). In my run some hours ago the venom commanders let my cannon main destroy the mystic stone without doing anything about it. After that my main punished these lazy fools of course, which went very well, too. I try to verify if that is repeatable – that would make HP much, much easier. I’ve only began to do HP recently (after latest patch), but I’ve always been able to kill stone using catapult without triggering any mobs. I’ve ran it around 4/5 times so far. As for Plateau of Sorrow goes, you don’t really have to kill all the commanders. After you kill MS there (should not aggro anything) with your cata, you can also kill Large Pavilon. There is a group right behind it, but commanders sitting on edge of cliff won’t come after you. And one question. How do you handle Alexandra? Ok, I’m pretty low equipped (around dg+1 level), so I can’t shoot her in 2 hits while taking hits from her and mobs… And she pretty much oneshots me :) Anyway… I have to painfully drag her from MS range to kill her… I was wondering if anyone got better plan. Btw got funny glitch today :) Alexandra got killed on stepping stones by flood (I was totally surprised cause I actually didn’t plan for that). And on top of that Hector decided to look what happened to poor Alexandra and ran alone all the way to where second summon gate is. I have noticed that in every HP run recently Hector has rushed to meet me at B12 – similar to Kaleston’s comment. I am going to run it a few more times to see if this bug keeps happening. Not complaining though makes mission much easier. I’m lvl 135 staff. I tried with witch+ora. Failed. Simply ran out of time. They killed cata many times, had to res at base many times – so time gone. My staff main (Claudiana) goes with oracle and janissary. Works like a charm. She did this mission without any problems since level 120 (even before finishing the upgrade quest). It happened to me once that Dark Alexandra went out nearly until the first SP. I like that, she should do that more often. 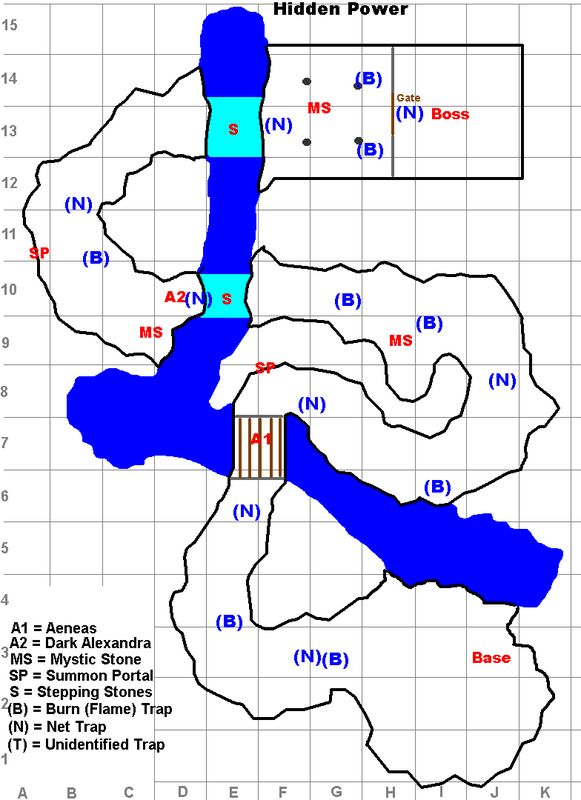 Im not sure if it has been changed even more since this map, but after the second summon portal i used like 6 scrolls trying to clear the traps coming afterwards and up to the boss. Just to find that i didnt destroy any traps, or run into any for that matter. Has it become even easier, or did my run just bug on me?